What does your luggage tag say about you? Ideal for Corporate Sales Meetings, Alumni Associations, Destination Weddings or any group travel. 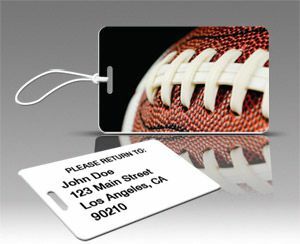 Do you have a vision for a custom luggage tag but lack the necessary design skills to make it happen? Our design team will work with you (at no charge!) to create a custom luggage tags from scratch. Please contact us at (877) 552-6961, to discuss your project and receive a free consultation and estimate. Made-to-order luggage tags featuring your artwork are available in our store. There is a onetime artwork setup fee of $20.00 per design. Photos can be submitted in any size. We will crop and/or resize the photo to best fit our tag’s format.Do you have a vision for a custom luggage tag but lack the necessary design skills to make it happen? Our design team will work with you (at no charge!) to create a custom luggage tag from scratch. Please contact us at (336) 999- 8370 to discuss your project and receive a free consultation and estimate. Order Your Custom Luggage Tag Now! After your order is processed we will place your photo or artwork into our design template and send you a proof via email. If there are any changes to the proof, please reply to the email with your changes. Any requested modifications or additions to your submitted artwork may result in additional charges. When we receive the request for changes we will notify you if there will be any additional charges before modifying your artwork. Production of your custom tag will begin only when we have received a confirmation of your acceptance of a final proof. Colors can vary greatly from one computer monitor to another. The proof you receive will be for artwork placement and accuracy only. We cannot guarantee color matching or accuracy on your computer monitor. If you require color matching, please contact us at (336) 999-8370 to discuss your design before ordering. Keep vital design elements away from the lanyard punch area but do not include cut lines or guides for the punch. Do not include rounded corners in your artwork. Treat the rounded corner as a bleed area. Full personalization is optional add-on service for all luggage tags. Please fill in all pertinent name, address, city, state, zip. Phone number is optional. Please note: When ordering a back side personalized luggage tag, the back side will always be white with black lettering.Product returns are not permitted when ordering a personalized luggage tag. Please be certain you have spelled all information correctly as we will image the product exactly as you have spelled it.